If you want to buy a Bluetooth speaker for the holiday season, AUVIO is the brand you should consider. I reviewed some AUVIO speakers and in my opinion, the HBT6000 and PBT1000 are the best choices at the moment because they are priced reasonably and still deliver good quality. You can read our reviews of the AUVIO HBT6000 and PBT1000 to see more details of the speakers. Now we will compare the two Bluetooth speakers and the reasons why you would choose either of them. 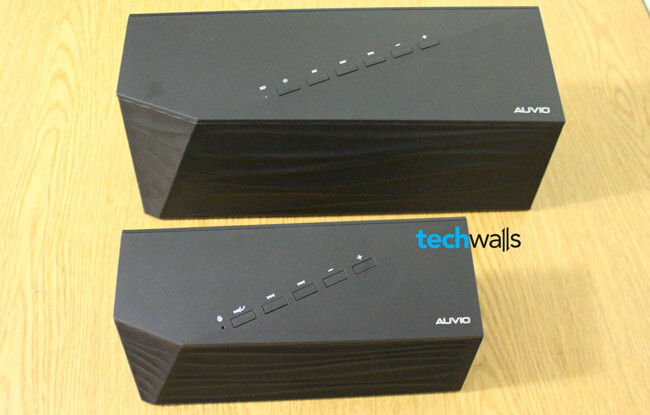 The two AUVIO Bluetooth speakers have almost identical design. They both have black color, grille with contoured wave pattern, controls on top and slightly lean backward. The only difference in design is the size as the HBT6000 looks like a big brother of PBT1000. However, the PBT1000 is still too bulky to be called portable, I hardly can put it in my backpack along with my MacBook. Actually I am still using one of the two speakers. Now, let’s check out some reasons why you want to buy the HBT6000 or PBT1000. Smaller size which could be slightly more portable. Good bass sound compared to many other Bluetooth speakers. Could be used as backup battery to charge other devices, no power outlet required. Impressive sound with Sonic Emotion Absolute 3D that delivers solid, rich and airy sound. Now I am going to disclose my choice. It is the HBT6000 simply because it delivers much more impressive sound that is suitable for listening to music or watching movies. Someone will debate that the HBT6000 is not portable and always requires power outlet. However, I don’t think the PBT1000 is portable due to its large size. The two Bluetooth speakers should only be used as home audio systems, and therefore, HBT6000 is better in my opinion. The HBT6000 is available on Amazon for $179 while the PBT is priced at $124. Let me know your choice.